Glentanner Park (Mount Cook) - Holiday Park and Activity Centre is the leading excursion and activity centre in this beautiful area, and offers a full range of exciting trips for all budgets and levels of bravery, whether it's a sedate (but spectacular) horse trek, or a full-on, adrenalin-pumping heli-ski. Because many of the activities operate out of Glentanner Park itself, it's a good idea to book in at one of the many accommodation options while you're here - everything from tent space to self-catering cabins. If you like getting up into the air, the Helicopter Line offers some amazing flights across the Aoraki/Mount Cook National Park, and will even land you right in the snow on the mountainside. Stare down below at moving ice rivers, fly over the summit of Mount Cook, then marvel at the glacial valleys around you - a sight you can only see from the air. For that extra buzz, you can also do a heli-picnic, where you're dropped on the side of a peak (no skiing required!) to enjoy a pre-prepared lunch right on the mountainside. You won't have eaten a meal anywhere like this before! Alternatively, take an Air Safari in a small plane, and zoom over the glaciers and alps, in a 45-minute thrill ride called 'Grand Traverse'. You'll see the awesome sights of the Fox, Franz Josef and Tasman Glaciers, circle the top of Aoraki/Mount Cook, and feel as free as a bird as your guaranteed window seat gets you as close as possible to the icy landscape below. For those who like to keep their feet on the ground (or on the water...), you can explore this glacial region by kayak or boat. Glentanner Park can book you aboard the Glacial Explorer, an incredible 3.5 hour trip around the Tasman Glacier, a very still, peaceful, and quite haunting monument to Mother Nature, the stuff of fantasy novels. If you want to get your hands dirty, or at least wet, then Mount Cook Glacier Sea Kayaking is the activity for you. Paddle past vast icebergs, listening out for the avalanches that occasionally crash down Mount Sefton in the distance (don't worry, you're perfectly safe!). Float across the mirror-still waters of the national park, where it's so quiet, you can actually hear the ice melting. Skiers can get on-board one of the packages available in the Mount Cook region. Leaving from Glentanner Park, you'll be whisked up into the air and over into the Alps, and dropped into one of the exclusive ski fields that just can't be accessed any other way. Various packages are available on Mount Cook and the Tasman Glacier, plus wider access to over 1,000 square kilometres of wilderness terrain. Intermediate to advanced skiers only. For a ground-eye view of this wonderful region, take a Tasman Valley 4WD Argo Tour right into the heart of the national park. Lasting 1.5 hours, your professional driver will take you over snowy, icy and rocky terrain in his eight-wheel vehicle, and get you to places no ordinary 4WD can reach. Cameras most definitely at the ready for this one. One of Glentanner Park's more unusual activities is ice climbing. Ross and Helen Ivey, who run Glentanner's working sheep station, can book you in for a special course and, depending on your ability (and fear factor) could then see you crunching your way up one of 18 different, graded routes for views that will astound you, and a good workout that's great for those leg and arm muscles. Truly unique. Glentanner Park (Mount Cook) - Holiday Park and Activity Centre also offers numerous walks and hikes. The centre is just a few minutes from Lake Pukaki, from where you can walk to the beautiful Tasman River, and watch the sun set over Mount Cook. In the national park, there are literally dozens of trails to explore, all detailed in the brochure available at Glentanner Park. If you want to save your legs, hop on a horse instead, as it's the best way to explore this working sheep station and surrounding area. Horse Treks last from half an hour to three hours, and you'll feel like a proper rancher in no time. Treks operate on demand from November until April. Advance bookings are essential as availability may vary. 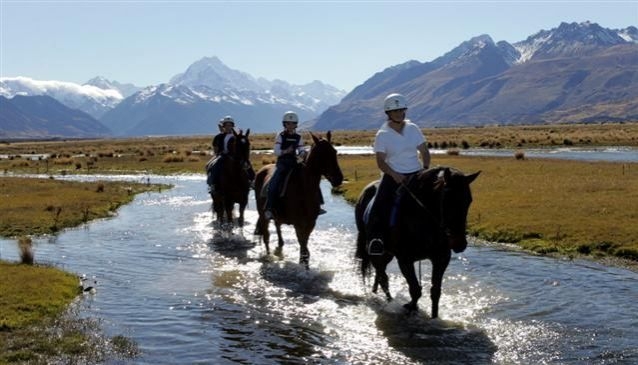 Glentanner Park also offers numerous trails for mountain bikers of all levels, fishing in Lake Pukaki and the Tasman River (rod hire available), plus exclusive hunting opportunities for Thar and Chamois both in the national park and Glentanner Sheep Station. Please visit Glentanner Park for bookings and latest price information.